Just in case GOP legislators on the Joint Finance Committee (JFC) had forgotten how dramatically their last state budget hurt Milwaukee Public Schools, parents, students, educators, and community members came to the April 5 State Fair public budget hearing to remind them. 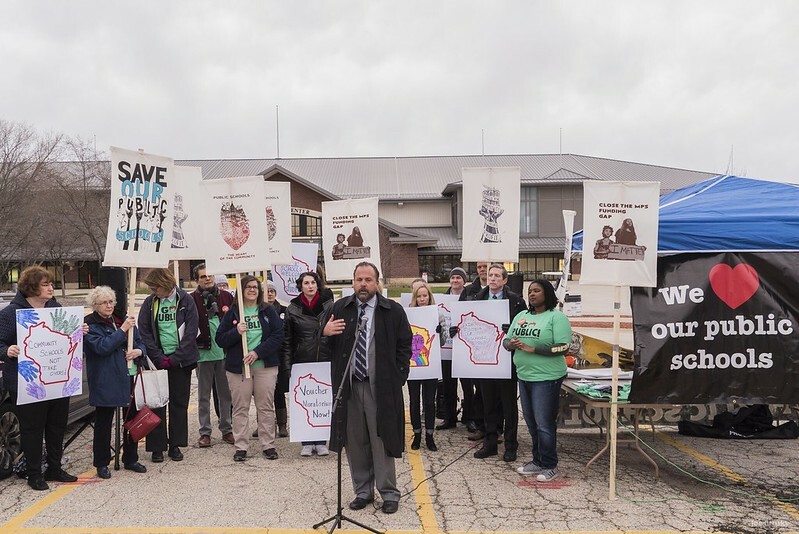 Public education supporters arrived early to the Milwaukee JFC hearing from all over Southeastern Wisconsin (Photo: Joe Brusky). The hearing provided a steady flow of public education supporters who, one-by-one, stepped up to the microphone to testify in support of fair and equitable public schools. The last two-year state budget that passed, not only continued the massive cuts to Wisconsin’s public schools by over $2 billion dollars, but it also snuck in the Midnight Takeover of Milwaukee Public Schools. By inserting the non-fiscal Takeover plan into an Omnibus state budget bill at the last minute, legislators knew they could pass the controversial provision without holding public hearings. The Takeover was eventually defeated by a popular uprising against it and the sham Takeover Czar it empowered over the city’s democratically elected school board. But, the residents of Milwaukee have not forgotten, nor are they willing to allow it to happen again in the next budget. Members of the Joint Finance Committee were seated above public hearing attendees and were separated by a yellow barrier fence (Photo: Joe Brusky). MTEA member and Kilbourn Elementary teacher Shari Redel speaks before the JFC. Every time a public education supporter spoke, other advocates wearing “Go Public” t-shirts stood in support (Photo: Joe Brusky). As a proud Milwaukee Public School teacher for the past thirty years and as the parent of a child who attends public school in a suburban district, I see firsthand the funding disparities, such as the unequal access to specialist teachers, lack of fully resourced libraries, large class sizes, and even the quality of hot lunch. I love my child very much, but I love my students too. It literally breaks my heart to know that my students are treated as less than because many are impoverished. I am asking you to raise the revenue limits so my students have the same opportunity as my own child. MTEA member and Wedgewood Park teacher Julie Meyer testifies before the JFC (Photo: Joe Brusky). My principal made the choice to fund a social worker, yet because of that choice I have thirty-nine students in my class. We should not have to make that kind of a choice. We should have well funded public schools so I can address the needs of all my students with a smaller class size and I can have a social worker to address those imminent student needs. I ask you to please maintain the budgeted request for a $200 increase per pupil. Thank you! MPS parent Jenni Linse-Hofschulte speaks in favor of fair and equitably funded public schools (Photo: Joe Brusky). These measures were not measures that were asked for by the constituency and parent and students in our state. In the next budget cycle the voucher scheme cap was expanded, but without accountability, a measure not being asked for by the constituency. In the next budget cycle, voucher accountability, as promised, never arrived and funding for our public schools was not restored, and finally in the cloak of darkness came the gifts of the OSSP otherwise known as the Milwaukee Takeover, a measure that was not being asked for by Milwaukeeans. I could have stood hear and asked for a lot today, but my request is really fundamental, please do not use the budget and Omnibus to strip local control and force measures on our schools. Show my 6 year old that you value and respect our voices, our community, and our public schools. A public school parent and supporter of “Save Our Schools – Wauwatosa” testifies on what she discovered when she inquired about sending her child with special needs to a private school (Photo: Joe Brusky). By the time Sam was four he finally found the right therapists to begin helping him and they told me to get him a public school evaluation. Prior to making that appointment I had called and toured several private schools to see what kind of services they could provide for Sam and his special needs. Each school’s representative told me they could not accommodate a child with special needs. So I was unsure if a public school could help if a private school couldn’t and I began to worry. I nervously called the Wauwatosa School District…and I was immediately put at ease as they reassured me that Tosa could meet our needs. Sam is now 9 years old, thriving at school, learning from incredible teachers on how to use coping strategies for any frustrations that pop up. This is the power of public school! I ask that you raise the revenue cap, providing $300 per year per student, and pause voucher school expansion until they have the same accountability measures as all publicly funded schools. Youth Empowered in the Struggle (YES) students testify before the JFC on how budget cuts have hurt them and their teachers (Photo: Joe Brusky). Today, we are here to demand that you fund our schools and stand up to Scott Walker, who already cut state tuition for undocumented students. This makes it harder for us to attend college. Our schools are underfunded and that is not a coincidence. We are Black and Brown working class students who live in impoverished communities. The lack of funding in our schools contributes to the school-to-prison-pipeline. How are we supposed to be productive citizens when you keep taking resources away from us? We are tired of being told their no money for art programs. We are tired of having to share worn down textbooks from the 1980s. Our teachers should not have to use their checkbooks to better serve us. Students, parents, educators, administrators, and community supporters spoke all day long in support of a state budget that respected Milwaukee Public Schools and other public districts in our region. Public education advocates kept tally of speakers throughout the day. Of the 216 total speakers, an astonishing 73 spoke in favor of a strong public education budget that respected MPS, but will the legislators be listening this time? Public education advocates set up camp on the State Fair parking lot outside the Milwaukee JFC public hearing, where these posters were hanging for all arriving to see (Photo: Joe Brusky). YES Students Testify Before the Joint Finance Committee from MTEA Union on Vimeo.